With the increased media attention to the Sahel in the aftermath of the killing of four U.S. soldiers in western Niger, U.S. commentators (especially on radio) sometimes confuse Nigeria with Niger. For example, some commentators linked the notorious kidnapping of the Chibok school girls in northern Nigeria to the Niger killings, episodes perhaps a thousand miles apart by road. This apparent confusion is understandable. Both countries are fighting jihadist insurrections and movements in the Sahel, the region that borders the Sahara on the south. The two countries share a long border, and Niger and northern Nigeria are predominately Muslim. The Niger-Nigeria border is artificial; it was drawn in the colonial period by London and Paris, a process driven in part by the desire to check German expansion in West Africa rather than recognition of ethnicities or other indigenous factors. Border crossings are also impossible to control, as a practical matter. In many ways, Niger and northern Nigeria have much in common culturally and the lingua franca of both regions is Hausa. Reflecting their respective colonial experiences, however, elites in Niger are Francophone, while those of Nigeria are Anglophone. Nevertheless, the contrast between Nigeria and Niger is, in more ways than not, stark. While Niger is geographically larger than Nigeria, 80 percent of its land area is covered by the Sahara desert. Its population, at a World Bank-estimated 20.67 million, is perhaps one tenth the size of Nigeria’s. Niger’s people are very poor, and the country consistently is ranked either last or next to last by the United Nations Human Development Index. 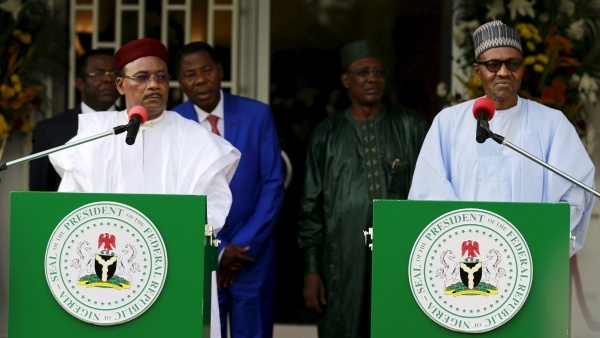 Elected in 2011, President Mahamadou Issoufou presides over Niger’s weak governance and limited bureaucratic capacity. Though both Niger and Nigeria have a long history of military coups, in the case of the former, military intervention has been much more recent. Nigeria is the giant of Africa, with an estimated population of more than 200 million. One out of every four or five sub-Saharan Africans is a Nigerian. It also trades places with South Africa as sub-Saharan Africa’s first or second largest economy and it is usually Africa’s largest producer of oil and gas (depending on theft and vandalism). While the country is mired in corruption and most of its citizens are poor, Nigeria is on a positive governance trajectory. In 2015, for the first time in its democratic history, the leader of the opposition became head of state through credible elections, in which the defeated incumbent conceded. U.S.-Nigeria bilateral ties are close, with traditional cooperation on a host of regional issues of mutual concern. For Washington, as for most other world capitals, Nigeria is much more important than Niger. With respect to jihadi movements, those operating in Niger appear to have close links with al-Qaeda and the Islamic State, with a heavy overlay of criminality associated with narcotics trafficking, smuggling, and kidnapping. While they enjoy some domestic support, jihadi movements in Niger tend to be largely influenced from abroad. In Nigeria, by contrast, Boko Haram is much more indigenous, and its persistence indicates greater domestic support. Boko Haram operates in Niger, Cameroon, and Chad, but primarily in areas that are ethnically linked to northern Nigeria. For members of these militant groups, as for most people, the Niger-Nigeria border is largely irrelevant. The United States partners with Niger in the fight against terrorism, and there are perhaps eight hundred U.S. military personnel from the U.S. Africa Command (AFRICOM) in the country. A large percentage, however, are support personnel rather than boots-on-the-ground. U.S. military personnel in Niger are almost entirely involved in the training of the Niger military and the maintenance of drone bases for surveillance purposes. Hence, U.S. forces in Niger are small in number and do not have a combat role. The military-to-military relationship between the United States and Nigeria is less developed. There are fewer U.S. military personnel stationed in Nigeria than in Niger. The Trump administration is in the process of selling sophisticated military aircraft (A-29 Super Tucanos) to the Nigerian military. That transaction, however, is cash-and-carry. It is not a form of military assistance. Historically, the Nigerian military has been stand-offish about a closer relationship with the United States.